"My cranky old 1934 oven is very small and slow, so I devised this method of cooking holiday meals. The slow cooker keeps the turkey breast moist, and cooking the dressing in the same cooker gives it a wonderful flavor." Melt 2 tablespoons butter in a large skillet over medium heat. Cook and stir onions and celery in the hot butter until onions are translucent, about 8 minutes; remove from heat. Place a plastic slow cooker liner into a 6-quart slow cooker. Place dry bread stuffing into the liner bag and sprinkle contents of seasoning packet over the bread. Stir cooked onions and celery, cranberry sauce, 1/2 cup melted butter, chicken broth, and 1/2 teaspoon salt into the dressing mix, taking care not to pierce the bag. Rinse turkey breast and pat dry with paper towels; season turkey breast with 1/2 teaspoon salt. Push the dressing mixture to the edge of the cooker and lay the turkey breast into the slow cooker with the pop-up timer facing upward. Cook on High until the pop-up timer in the turkey breast pops, 4 to 4 1/2 hours. Transfer turkey breast to a cutting board and let stand for 10 minutes before serving. 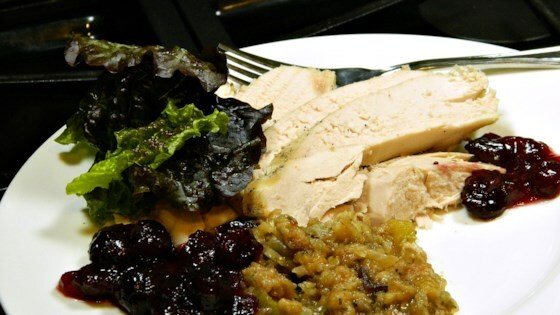 Transfer dressing to a serving bowl and serve alongside turkey. If you plan to make gravy, use 1 1/2 cups instead of 1/2 cup of broth to cook the turkey; when the turkey is done, remove it to a cutting board and dip 2 cups of pot liquor from the slow cooker and bring to a boil in a skillet. Mix another half-cup of pot liquor with 2 tablespoons of cornstarch; add to the skillet, stirring until it incorporates and thickens. Taste gravy for seasoning. Meanwhile, using a slotted spoon, place the dressing in an ovenproof pan and bake it uncovered for 15 or 20 minutes at 350 degrees F (175 degrees C) to dry it out. If you are not ready to serve when it is done, turn the cooker to warm and leave the lid on.